I've been using this site for my business storage which i visit most days. Access is great and staff are super helpful. Can only think all the other reviews here were written by friends and family. Totally doesnt reflect my experience. Friendly helpful guys, but dont seem to have much more to do than spend their day looking for payments (despite holding your valuable possessions). Reflects shockingly on the brand, but no one seems to care. Used to be a private operation but now a private equity franchise model. Constantly sending out bills, weeks early, double charging excess fees, emailing, ringing, texting and locking you out of your space. Anything to bring the money in the door more quickly - makes me worry how solvent they are. Also a lot smaller storage spaces - they tell you it will be ok nnd then when it tsnt charge you more for additional space. So 2/3 the space of Kennards, just up the road, and 30% more expensive. Seems the game is to promise the world to get you in, knowing its just too hard to move. Thanks for the great customer service, Remy! We appreciate it very much. Great service, helpful, and friendly. Always willing to assist, very clean premises in a great spot. You could ask for better in a storage facility service. David and Kara are the best! Service excellence at its best. Clean facilities. Easy to get to. Prompt and great service. Keep up the good work. Kara and David are great. They helped organise to get my stuff stored although I couldn't be there in person which really helped me out. Happy to meet them in person soon. Thank you guys! Great work! Very helpful staff, very convenient and exactly what i was looking for. For sure will use again. 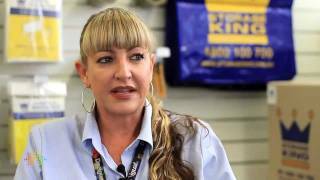 The Staff at Storage King Woolloomooloo have all been amazing - always helpful and nothing was too much trouble both above and beyond the call of duty :-) I'm very grateful for their help and excellent service and facilties. Highly recommended - many thanks. I've had some bad experiences with storage but Storage King Wooloomoolloo not only had an undertsanding for how stressful a move can be but were helpful in all apsects. Great rate, Great space with easy accessand very secure..that with a hospitable and friendly manner will always make me reccomend thus buisness.. I couldn't speak highly enough about the Woolloomoolo Storage King and the staff. They are helpful, friendly and more than accomodating. I run a small local charity and was in need of a space to store donations and Kara and her team generously assisted me in any way they could. Great to see local business supporting it's community!! 10/10 service!! If you have storage problems, Storage King Woolloomooloo has Sydney CBD storage solutions! At Storage King Woolloomooloo, we have experienced and friendly staff that are ready to assist you with your storage needs.We understand how stressful it can be, why not allow our staff to handle it for you? We can help with packing tips, removalists & how to make the most of your storage space.